The following are popular questions the Research Center has received about the infamous crime duo Bonnie and Clyde and the Barrow Gang members. What made the couple so hard to apprehend? Clyde Barrow kept on the move almost constantly, keeping to back roads and driving faster than law enforcement would usually anticipate. He also kept overwhelming firepower close at hand at all times, in the form of Browning Automatic Rifles (BARs) stolen from National Guard armories, as well as sawed-off shotguns and pistols. Barrow tended to panic and open fire if he saw anything that didn’t look right to him, and he usually out-gunned the police, so when they were able to track him down, or run into him and his gang by chance, Barrow was usually able to shoot his way out of being captured. Frank Hamer was a "Ranger’s Ranger," could you tell us a bit about him and what he went through in catching the bandits? Frank Hamer actually wasn’t a Texas Ranger at the time of the ambush on Barrow and Parker. When Governor Miriam "Ma" Ferguson was reelected in 1932, Hamer and several other Rangers resigned because of the corruption and “softness” on crime during her first term a few years earlier. She fired the entire Texas Ranger force anyway on the second day of her new term and replaced them with her political appointees. Hamer was working as a special investigator for the Texas prison system, with a commission from the Texas Highway Patrol, at the time of the ambush. Although Barrow traveled the back roads and was difficult to track, Hamer recognized a pattern to his travels and was able to start anticipating the gang’s moves. Credit for catching them in the ambush, though, belongs as much to Louisiana’s Bienville Parrish Sheriff Henderson Jordan as it does to Hamer. Jordan was the one who made contact with the family of Henry Methvin, one of the gang members, and negotiated the deal for amnesty for Methvin in exchange for information leading to their apprehension or deaths. Hamer’s role was to secure a deal for immunity for Henry Methvin for crimes committed in Texas in order to gain the cooperation of Methvin’s father. Just what the nature of the deal was, and the extent of the elder Methvin’s cooperation with law enforcement is still debated among writers on the subject, and details vary from one source to another. The upshot is that Hamer and Jordan should get equal credit for finding Barrow and Parker – again, which of the two was more responsible is still pretty hotly debated. If you could, please describe their crimes and how they got bolder over the years. Most of the Barrow Gang’s robberies were small grocery stores, gas stations and small-town banks; Barrow’s habit of sticking to back roads meant that many of their crimes were committed in small, out-of-the-way towns with little in the way of law enforcement. Barrow and Parker frequently visited their families in the Dallas area, and came into violent contact with officers on some of those trips. The gang’s tendency to open fire when they thought they had been detected made the progression of their encounters with the law more desperate, if not so much bold. “Barrow and Parker” or “the Barrow Gang” were the more common ways the duo was cited at the time. While "Bonnie and Clyde" was one of the ways the duo was referred to at the time, it became most popular way to refer to them after the well-known, but inaccurate, 1967 movie. The fact that Barrow and Parker were alone when they were killed has obscured the fact that they usually traveled with a gang, made up of Barrow and Parker, along with, at various times, Clyde’s brother Marvin (“Buck”), Buck’s wife Blanche, teenager W.D. Jones, Ralph Fults, Henry Methvin, Joe Palmer, Raymond Hamilton and a few others. One problem with the accounts of the actual crimes is that many of them come from sources that are less than reliable. The Barrow and Parker families spent the rest of their lives – and some of them survived into the 1980s – doing their best to deny that Clyde and Bonnie had killed anyone except in self-defense. They blamed other gang members for most of the murders, especially of the victims who were not law enforcement officers. W.D. Jones gave several accounts of his time with the gang, especially after the 1967 movie came out, but his stories varied, often contradicted the evidence. Being a criminal, he sometimes took credit for Barrow’s crimes, including murders, and at other times blamed Barrow for his own offenses. A good many authors of books on Barrow and Parker in the last decades have relied heavily on these erroneous and slanted accounts. Many assume they never hurt civilians, but that isn’t true. Could you tell of their crimes against normal people? The first person killed in one of Clyde Barrow’s robberies, J.N. Bucher in Hillsboro, was a shopkeeper. Various writers have claimed that Barrow was the driver for that robbery-murder and that he never entered the store, but Bucher’s wife saw her husband’s killer and identified Clyde Barrow’s photo. On Christmas Day 1932 Barrow and Jones were trying to steal a car in Temple when the owner, Doyle Johnson, ran out of his house to stop them; he was shot at close range in the throat and died the next day. The Barrow family claimed that W.D. Jones pulled the trigger, but it’s more likely that it was Barrow. Jones told it both ways at different times. In June 1933, Barrow missed a caution sign and drove off of an unfinished bridge embankment; the car was wrecked and Bonnie Parker was badly burned by battery acid. The gang terrorized the people from a nearby farm who had gone to help them, occupying their house and stealing their car. At one point, a gang member – most sources say W.D. Jones – opened fire with a shotgun on a young mother in the house who was checking on her baby. Her hand was badly injured and the infant was scratched by fragments from the door that took the brunt of the blast. On a number of occasions the Barrow gang sprayed automatic rifle fire indiscriminately in populated areas as they sped away from crime scenes or roadblocks. On a different level, most of their robberies were against family-owned stores and filling stations, which victimized regular citizens rather than institutions such as banks. They were not in any way Robin Hood-like figures. They were violent criminals who were responsible for at least a dozen murders, including people who were simply between them and what they were trying to steal. How did they obtain all the guns they carried? I know they had Three Automatic Rifles, 2 shotguns, 3 pistols, a revolver and thousands of rounds of ammunition in their "death car"? Were these stolen or store bought? If they were store bought then would it have raised concerns? Clyde Barrow and his gang stole most, if not all, of the weapons they used. The Browning Automatic Rifles (BARs) and Colt .45 automatic pistols, as well as most of the ammunition they had, were burglarized from National Guard armories across Texas and the Midwest. The armories didn’t have any real security back then. The source of some of the civilian weapons, like other kinds of pistols, as well as shotguns, is not as clear, but it’s known that they stole firearms in hardware store burglaries. What made Bonnie and Clyde so well known? There were many active criminals in the 1930s, so why are they such a big name today? Bonnie and Clyde are so well known today because of the movie by that name that was made in 1967. The movie is actually why they are called “Bonnie and Clyde” these days – while they were alive, they were usually called “the Barrow Gang” or “Clyde and the Parker woman”, or by their full names. The movie Bonnie and Clyde was not even remotely accurate. The director himself said that the real Clyde and Bonnie were not important to the movie he made, but the movie was a huge hit, and it made the two famous again, and made the term “Bonnie and Clyde” the only way that most people refer to them now. Bonnie Parker wrote a poem called “The Story of Bonnie and Clyde” that was published in a Dallas paper the day they died, but that was one of the few times that they were referred to as “Bonnie and Clyde”. They had some notoriety before they were killed because the police had found a camera and undeveloped film after the Barrow Gang fled from a hideout in Joplin, Missouri. The photos showed them clowning around with guns and standing in front of stolen cars, and when they were printed in the papers they made an impression on the public because they were more personal than the mugshots that people usually saw in stories about criminals. The Barrow Gang was better known in the areas where they robbed stores and gas stations – they only robbed banks a few times – than in the rest of the US, but they were not popular heroes at the time, the way that they are sometimes portrayed today. People were terrified of them because they had a tendency to start shooting if anything looked wrong. By the time they died, they had killed at least 12 people, mostly law enforcement officers but also some shopkeepers who simply got in their way. In today’s terminology, they were serial killers. The Barrow Gang had been largely forgotten outside of Texas until the movie was released in 1967. 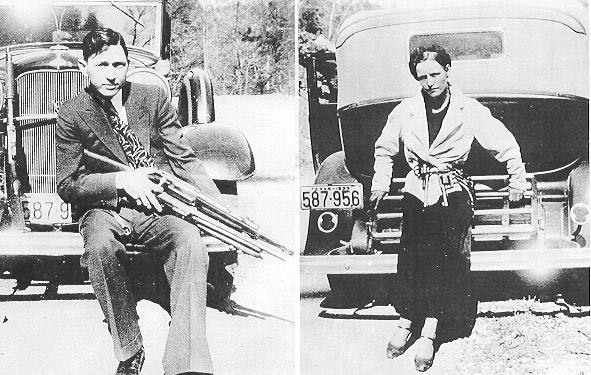 Before that, other criminals of their time like John Dillinger, Pretty Boy Floyd and Baby Face Nelson had stayed famous, but it wasn’t until after the movie that “Bonnie and Clyde” joined the list of most famous outlaws of the era. By the way, although she had gone back to using her maiden name “Parker”, Bonnie’s legal name at the time that she died was Bonnie Thornton. She was married to a different criminal named Roy Thornton, who was in prison the entire time that she knew Clyde Barrow. When Clyde was released from prison, did he try and live a regular, crime free life? If so why did he go back to being a criminal? Clyde had had an assortment of odd jobs when he was a teenager, but he started stealing at the same time, and after he was released from prison he never made any attempt to find a legal job. How did their families react to their deaths? The Barrow and Parker families had both been expecting the two to be killed in one of their shootouts with police for some time, so while they were naturally grief-stricken when it happened, some of them also expressed relief that it was finally over. Starting just a few months after their deaths, members of both families started trying to rehabilitate their names and reputations by publishing ghost-written books and articles claiming that they had only killed police officers in self-defense or that other members of the gang had done the actual shooting. Some Barrow and Parker family members lived up into the 1980s and 1990s, and a good number of the more recent books and documentaries about the Barrow Gang have relied pretty heavily on the family versions of the story, or on stories told by other members of the gang, none of which are really all that reliable. After the movie came out in 1967 some of the surviving relatives and gang members became minor celebrities for a while. 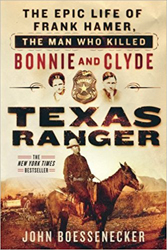 To learn more about Frank Hamer and Bonnie & Clyde, please read Texas Ranger: The Epic Life of Frank Hamer, The Man Who Killed Bonnie and Clyde by John Boessenecker. This book is available for purchase in our Gift Shop. Please click here to order one today.